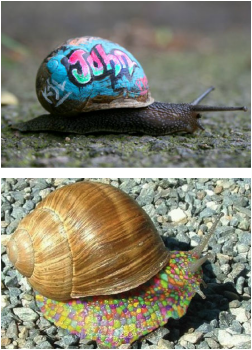 Follow the snails, but slowly! Writers enjoy snails. I think that must have something to do with the squishiness of their bodies. They are yucky and gooey and look a little like what we imagine aliens look like. It’s odd how snails attract some people. They attract scientists who want to know more about this strange creature that is so different to us. They attract poets who like to mold their soft bodies to the contours of their imagination. Some people even like to eat snails! My mum likes to eat snails. In the seaside town of Brighton, England, where she lives, you can buy winkles, small sea snails. I remember how she would sit at the kitchen table and pop them out of their shells with a pin. My mum wasn’t very kind to snails. The snails that lived in our garden liked to eat her flowers and vegetables, so she used to pick them off the plants and put them in a bucket with salt. After a few days, the “snail pie” was done, and I would dump out their shells on the compost heap. The chalky stuff from which snail shells are made is good for gardens. Writers like snails also because of their shells. 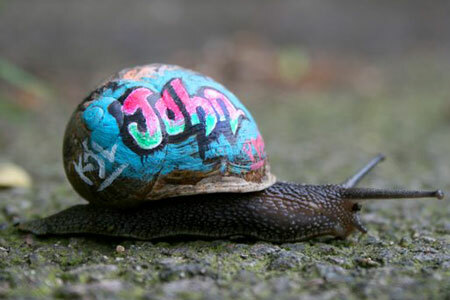 Some writers enjoy the idea of carrying a house around with them on their back like a snail. There are times when all of us would like to instantly curl up, cozy and safe inside a shell. I also think writers like snail shells because they can fill them with the contents of their imagination. Writers like snails’ eye stalks, what some people call “ears.” I was a bit kinder to snails than my mum. I used to pick them off the crazy paving so the thrushes wouldn’t get them. If they thought I was kind, the snails would come out of hiding on my hand and roll out their eyes. Then they would wave them about and look me over. Snails are curious creatures, and if you are reading this book, you are pretty curious too! This electronic book is what is called a “natural history.” In the past, scientists often had other jobs as well. In fact, science began as a hobby for many men and women, and their science books, sometimes called “natural histories,” were written for everybody, not just other clever scientists. A natural history might contain all sorts of information on an animal or place, including folk tales and poems. The Book of Snails has lots of information about slugs and snails, including poems and folk tales and more, from all over the world. The book is divided into chapters that explain all about the snail, where and how they live, and how they are used by humans and other creatures. You should know that all these writers have written about snails because, like you, they are amazed at these delicate, little creatures and, like you, they want to know more about them and the world which we share with them.